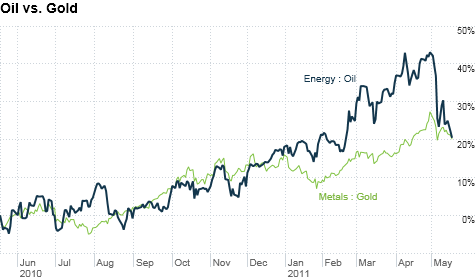 Click chart to track commodities. NEW YORK (CNNMoney) -- Commodity prices took a tumble Tuesday, as disappointing housing data and a stronger dollar pushed already nervous investors out of the market. Crude oil for June delivery lost 0.47%, falling 46 cents to $96.91 a barrel, while gold dropped 0.71%, or $10.60, to $1,480.00 an ounce. Silver declined 64 cents to $33.49 an ounce, a loss of 1.88%. Optimism was in short supply after the government released a housing report that showed the number of new homes being built fell 10.6% in April. Meanwhile, a strengthening dollar put downward pressure on oil prices. A stronger dollar tends to drive down crude prices because oil and other commodities are priced in the U.S. currency, making them less appealing as the dollar rises. The stronger dollar and weak economic numbers are the primary factors driving commodity markets at the moment, according to Daniel Flynn, an energy trader at PFG Best. But traders are also keeping an eye on the flooding Mississippi River and oil refineries in Louisiana. Any disruption in the refinery process could potentially reverse crude's slide, Flynn said. Barring that development, traders have a few outstanding worries. The broad underlying fear is that the U.S. economy is slowing down, and traders have a slew of data to back that theory. And Flynn specifically pointed to the end of the Federal Reserve's second round of bond buying, eurozone debt worries and the political battle over the debt ceiling as destabilization factors. "We're in a correction mood on crude and gasoline ... and it's kind of wait and see on these other issues," Flynn said. Is the inflation scare over?